It’s crazy I’m calling it a sequel, because it wasn’t…kinda sorta. This part of the movie was actually supposed to be happening at the same time the original 300 went down…wth. That made no sense. I thought the movie was going to be more about King Xerxes, but unfortunately it wasn’t, and instead centered around and angry Greek woman named Artemisia. Her character was cool, but also weak at the same time. I will give this movie props because the opening scene had me visually entertained, but that soon fell. Unlike the original 300, there was no character development, or story to keep you interested or involved in the movie. It felt as if they tried to imitate the first movie, but failed miserably. There is nothing but sword slinging, and blood gushing to fill the emptiness of this movie. The fabulous visuals that opened the first scene quickly fell to corny CGI sequences…womp womp. 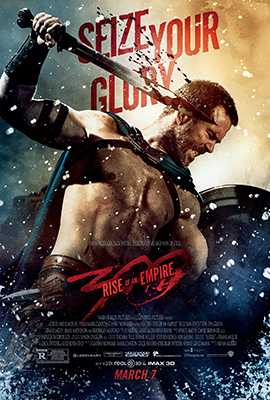 This entry was posted in Uncategorized and tagged 300 Rise of an Empire, Eva Green, fantasy action, Hans Matheson, Lena Headey, Rodrigo Santoro, Sullivan Stapleton. Bookmark the permalink.